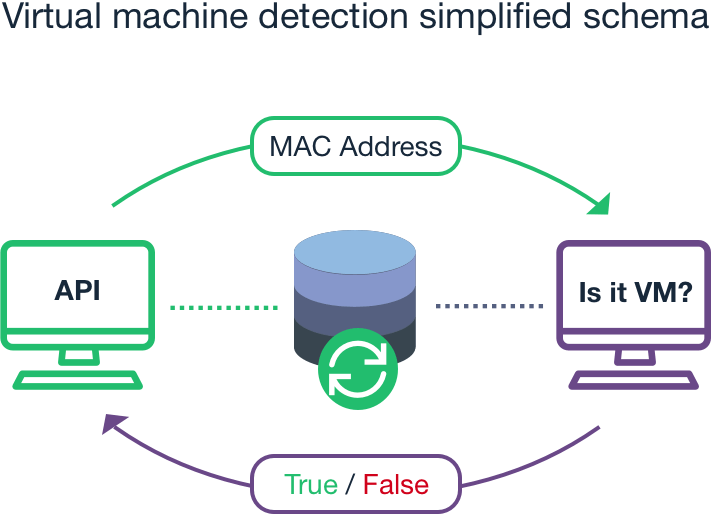 How to detect a Virtual Machine by its MAC address? Our MAC Address API outputs a field called macAddressDetails.virtualMachine. If it detects that a Virtual Machine is using this MAC address, it outputs its vendor name (e.g. ”VMWare”). Otherwise, it outputs “Not detected”. To detect the Virtual Machines, we build our VM Knowledge Base, which stores information about known relations between MAC addresses and Virtual Machines, and patterns, based on which the Virtual Machines assign MAC addresses to the virtual network interfaces. We constantly scan the Internet for such information. It’s systemized, stored and verified. Our research team installed the Virtual Machines and performed experiments, trying to identify patterns on how their network interfaces receive MAC addresses. We are warmly welcoming your thoughts and suggestions with regard to this article. Please feel free to contact us! What is an Organizationally Unique Identifier (OUI)? What MAC sizes are there?